The snow laden branches of the fir tree sparkled in sunshine. Overnight temperatures hovered near zero. Could anything survive this cold? Apparently so, because all at once that tree blossomed with birds. One by one they slowly emerged from their nightly roost. First a quail and his crew appeared. Juncos, house finches and goldfinches soon followed. Even a flicker said hello. Having survived the night, sustenance was next on the agenda. 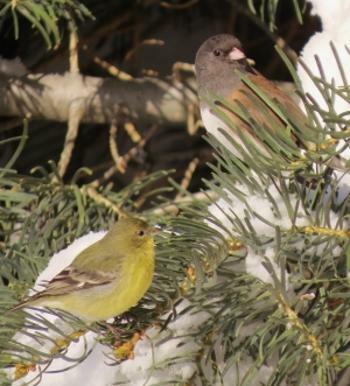 Birds have a number of cold weather survival tactics tucked under their wings. I witnessed a few of those remarkable adaptations in action this morning. 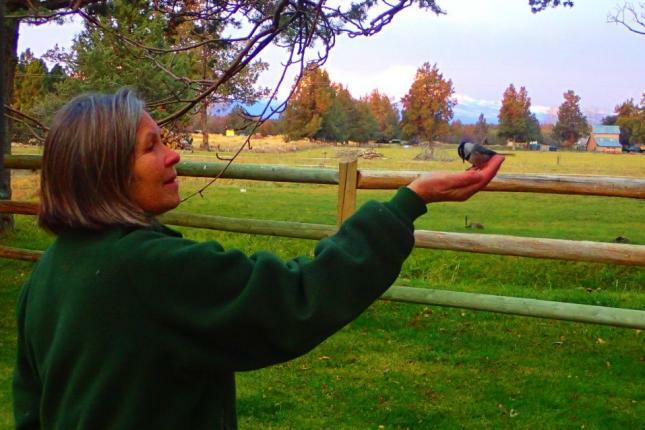 In laymen’s terms, birds fluff up, flock together and feed their faces. Let me explain. Just as I donned a down jacket to stay warm to observe these birds, birds are wearing their first layer of defense against the chill—their feathers. Feathers provide insulation. And if they can trap some air between those feathers, their body heat will warm the air and provide additional protection. 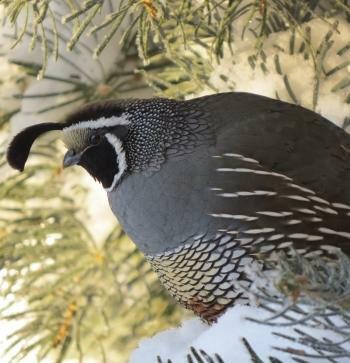 Hence, it is not uncommon to see birds “fluffed up” in cold temperatures. Zero degrees is no time to be claustrophobic if you’re a bird. Huddle up, cram in and get close. That’s right. In freezing temperatures, that desire for solitude just might be the death of you. Turns out, there’s warmth in numbers. At night birds often crowd together in a tight space to share body heat—just as I spied in that fir tree. A flock of twelve quail nestled wing to wing tucked amongst the branches until dawn’s light. In addition sharing heat, flocks provide more eyes to look for food and more eyes to keep a look out for predators. I don’t know about you, but cold weather makes me hungry. And while I can consume half my weight in calories after a good ski, my caloric consumption is not life or death—as it is for a bird. When the temperatures plummet, birds must eat more to generate heat. Putting on the calories will stoke their fat reserves, which can save their lives (O, that I were a bird…) It’s a metabolic rate thing. This explains why as soon as it was light, the birds emerged from the tree and flocked to the nearest buffet—aka the feeders. So now you know what I do on those cold arctic mornings. I watch birds. Some days, it just doesn’t seem normal—I should probably be indoors with a cup of coffee and the morning news. But that’s okay. Even John James Audubon was a tormented birder of sorts: “I feel I am strange to all but the birds of America.” Well said, John. Happy Birding.